The connector descriptions listed here are the '86-'87 style that are typically square or rectangular in shape. In '88, Mazda changed to a more weatherproof "round" shaped connector for it's harness-to-harness connections. The harness routing and wire colors are the same as the earlier '86-'87, it's just the connectors that changed. 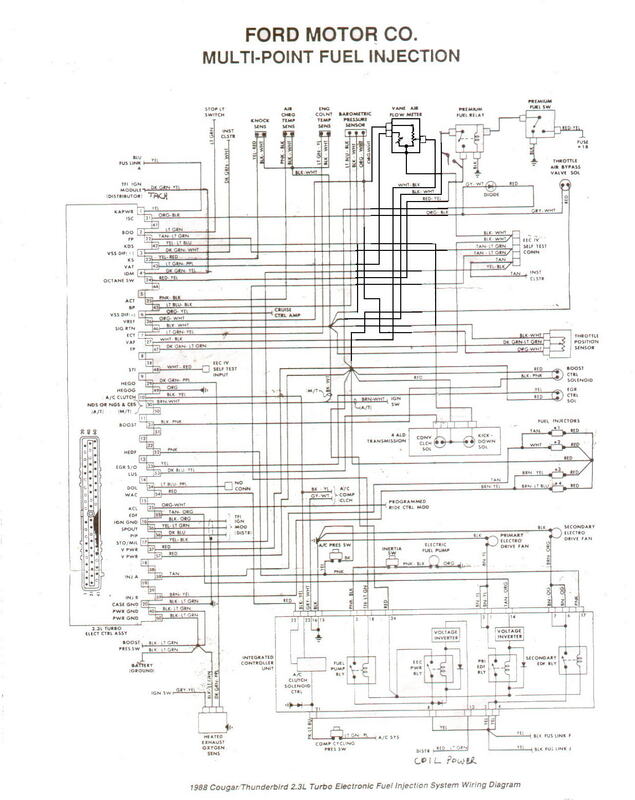 In '88 Mazda also changed the schematic style and connector ID numbers in their Factory Wiring Diagram Manuals. The '86-'87 and '88-'91 factory schematics appear very different, but it's just that they are drawn using a different layout style. Although the different style connectors are incompatible, the wire routing and color codes are nearly identical. In the information below, we will list the connector ID numbers for the '88-'91 RX-7 in ( ). Front Harness... this harness is the main harness for the front of the RX-7. It's basic job is to connect all the other sub harnesses in the front to the rest of the car. It comes thru the firewall on the extreme driver's side of the firewall, and runs forward to the radiator support to the relay rack (under the plastic cover in front of the radiator), and across to the horns, the coolant level sensor (in the top of the RX-7 radiator), headlites, front parking lites, etc. The front harness also connected to the engine harness at X-04, X-05, X-06, and X-08. It connects to the Emissions harness at X-15, and X-16. It connects to the instrument panel harness at X-10 and X-11. Engine Harness... this harness is located on the driver's side of the engine compartment. It contains wires to the rotary engine's battery cables, ignition system, starter, alternator (non-turbo), oil pressure sender, transmission switches, dash gauges, and various warning sensors. This harness is no longer needed, but it contains some connectors which should be salvaged for later use. Emissions Harness... this harness is located on the passenger side of the engine compartment. It contains wires between the rotary engine's ECU to the rotary's injectors and ECU sensors. Most of this harness is no longer needed, but it also contains wires to the wipers, cruise control, water temp sender, and alternator (turbo only), which should be retained when the rest of the harness is removed. 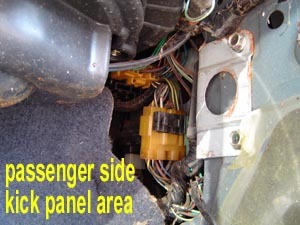 Connector X-01...is located on the side of the main fuse box, located just ahead of the driver’s side strut tower. ...Black...when the rotary’s engine harness is removed from the car, a vital wire is lost that runs from the 80A fuse in the main fuse box to the large stud on the back of the RX-7’s alternator, and also to the ignition switch through connector X-23 (a large single terminal connector located between the main fuse block and the driver’s strut tower). This wire was originally black, and very thick, appx. 10ga. Be sure to replace it with wire of at least the same capacity, that connects all three points in the circuit. ...Black w/ white stripe... there are 2 of these wires, which are 12v+ when the ignition is on. A good source for power for your V-8's ignition system. ...Yellow w/ red stripe... this wire goes to the rotary engine's oil pressure sensor. Install this sensor into the Chevy/Ford (the threads are compatible), and your in-dash oil press gauge will work. ...Black w/ yellow stripe... this wire is the power wire to the back-up lite switch, and simply connects to one leg of the switch. ...Red w/ green stripe... this wire goes back to the back-up lites, and connects to the other leg of the switch. ...Black w/ white stripe... (turbo only) this wire connects to the RX-7's alternator through the small "T" shaped plug. This wire forms the top of the "T". ...White w/ black stripe... (turbo only) this wire also connects to the stock RX-7 alternator through the small "T" shaped 2 conductor plug, and connects to the bottom leg part of the "T". Connector X-06 (FE-04)...this connector is a rectangular 4 conductor (2 rows of 2) located on the extreme driver's side between the firewall and strut tower. All 4 wires in this connector (blue, green, red, and white) were between the rotary's crank angle sensor and it's ECU, and are not needed. Connector X-07...this connector is at the Fuse box. ...Black w/ white stripe... this wire comes from the starter cut relay (controlled by the anti-theft system), and is the one that energizes the starter to crank the engine over. It can be connected to the Chevy engine's starter solenoid "S" terminal (the small post closest to the block), or the "S" terminal Ford engine's firewall mounted starter relay. ...Black w/ white stripe... (non turbo only) this wire connects to the RX-7's alternator through the small "T" shaped plug. This wire forms the top of the "T". ...White w/ black stripe... (non turbo only) this wire also connects to the stock RX-7 alternator through the small "T" shaped 2 conductor plug, and connects to the bottom leg part of the "T". ...Yellow w/ black stripe... (turbo only) this wire needs to be connected to the rotary engine's water temp sending unit (installed in the Chevy engine) for the RX-7 dash gauge to work. ...Green w/ black stripe... (across from black w/ red stripe wire)(non-turbo MT only) this wire needs to be connected to the water temp switch (grounds to turn fan on) to control the stock RX-7 electric cooling fan relay. This connection is not required unless you want to use the stock RX-7 cooling fan controls. ...Blue... this wire provides power to the wiper motor thru a 15 amp fuse at X-07 when the ignition switch is in the "RUN" position. It needs to connect to the plug at the wiper motor if the emissions harness is completely removed. ...Blue w/ yellow stripe... this wire needs to connect to the plug at the wiper motor if the emissions harness is completely removed. ...Blue w/ white stripe... this wire needs to connect to the plug at the wiper motor if the emissions harness is completely removed. ...Blue w/ red stripe... this wire needs to connect to the plug at the wiper motor if the emissions harness is completely removed. ...Black... this wire needs to connect to the plug at the wiper motor if the emissions harness is completely removed. It grounds the wiper motor case. ...Green... this wire needs to connect to the plug on the cruise control actuator if the emissions harness is completely removed. ...Green w/ black stripe... (across from green wire) this wire needs to connect to the plug on the cruise control actuator if the emissions harness is completely removed. ...Green w/ white stripe... this wire needs to connect to the plug on the cruise control actuator if the emissions harness is completely removed. ...Black w/ yellow stripe... these 2 wires are switched by the main relay thru a 40amp main fuse. The ignition switch energizes the relay in the "RUN" position, making it a good source for injector power. ...Black w/ white stripe... these 2 wires are switched by the normally closed side of the starter cut relay, energized from the "START" side of the ignition switch (powered by 80A main fuse). They are also powered by the normally open side of the main relay, which energizes them when the ignition switch is in the "RUN" position thru a 30amp main fuse. They formerly powered most of the rotary engine's emissions and control solenoids and switches. ...Blue w/ red stripe... this wire comes directly from the "+" side of the battery thru a 7.5 amp fuse at X-07 (which gets it's power from a 60 amp main fuse). ...Yellow w/ black stripe... (non turbo only) this wire needs to be connected to the rotary engine's water temp sending unit (installed in the Chevy engine) for the RX-7 dash gauge to work. ...green w/ black stripe... (turbo only) this wire needs to be connected to the water temp switch (grounds to turn fan on) to control the stock RX-7 electric cooling fan relay. This connection is not required unless you want to use the stock RX-7 cooling fan controls. ...Lt green w/ black stripe... (turbo only) this wire is switched (grounded) thru the normally open side of the Power Steering Relay. It is not necessary for proper power steering operation, but is used to signal a ECU/PCM to up the idle speed when power steering pump pressure is sensed at the Power Steering Switch. ...Yellow w/ blue stripe... this wire is the tach signal wire. Connector Ba-08 (F-34)... this is a small 2 conductor plug, with 2 large wires, going into the trailing coil. ...Black w/ yellow stripe... these 2 wires are a great source for switched ignition power for your Chevy/Ford engine. The power comes through the main relay from a 40A fusible link. ...Black w/ a white stripe... this wire provides 12v 15A fused power from the battery. ...Blue... this wire goes to the fuel pump. ...Black w/ red stripe... this wire used to go to the rotary's ECU, which sent out 12v+ through this wire to energize the circuit opening relay and turn on the fuel pump until the airflow meter switch was closed. ...Black... this wire is a ground. ...Brown... this wire goes to a switch inside of the airflow meter (located ahead of the right front strut tower), and needs to be grounded to make the relay energize the fuel pump. Although simple grounding of this terminal will make your fuel pump operate somewhat normally, We strongly recommend that you ground this terminal through an oil pressure safety switch, so that the fuel pump will not continue to operate should the engine die, or in case of an accident. Connector C-01 (ME-01)... the C-01 connector is located on the back of the dash pod, on the left (driver's) side. Of the many other wires that are there, the 2nd gen RX-7s also has a speed sensor built into the speedometer head. ...Green w/ red stripe... this is the wire from the speed sensor. It is a reed switch, operated by a rotating magnet at the end of the speedo cable inside the dash pod, so the output is a square wave. The switch cycles open and closed a total of 4 times per revolution, which when combined with the 1025 revolutions per mile of the RX-7, makes a 4100 pulse per mile speed signal. The US standard for speedometers is 1000 rev per mile, which makes for a 4000 PPM signal that is often used by computer controlled engines. The difference between 4000 and 4100 PPM is only around 2%, so further correction is often not required. The other leg of the reed switch is grounded internally, and the signal can be used as a vehicle speed input. ...Blue... this wire comes from the AC thermostat. ...Blue w/ orange stripe... this wire needs to be connected to a 12v+ ignition power source in order to power the fan amplifier. ...Blue w/ black stripe... this wire is power from the ACC side of the ign switch, fused at 10A. ...Red w/ yellow stripe... is from the blower control unit. ...Black w/ white stripe... this wire goes to the AC compressor clutch magnet. ...Blue w/ white stripe... this terminal/wire needs to be grounded to allow the AC clutch to be energized. It was formerly grounded by the RX-7's ECU. RX-7 Cooling Fan Controls (non-turbo MT only) You may or may not want to use this circiut. The wiring and controls are already in your RX-7 and connected to the cooling fan warning lite and cooling fan indicator, which is handy if you want to use an electric fan. Power comes thru a 15amp fuse at X-07. This circiut is almost entirely within the front harness. One exception is the wire to the water temp switch (formerly located near the filler neck on the rotary engine). This wire should be connected as described under X-15(FEM-01)non-turbo or X-16(FEM-02)for turbo II above. The Water Temp Switch from the rotary can be used, or use the switch of your choice. The switch circiut grounds the green w/ black stripe wire to turn on the fan. Variable Assist Steering Wiring... this circiut is routed entirely thru the front harness, so no re-routing is required. ...Blue...a power wire directly to the wiper motor from the ignition switch's "ignition" position. ...Blue w/ yellow stripe...to the wiper motor from the delay relay. ...Blue w/ white stripe...connected between the switch and wiper motor. ...Blue w/ red stripe...connected between the switch's "hi" position and wiper motor. ...Green...power wire to coil of actuator's relay. Also powers "cruise" lite in the dash. 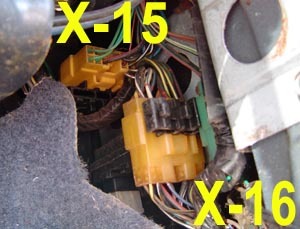 The description and location of these connectors is listed in the front harness section above.